The Larson Electronics EPS-25A-3W Explosion Proof Feed Through Three Way Switch is UL Listed Class 1 Division 1 & 2 and Class 2 Division 1 & 2 and provides a safe and secure method for operators to interrupt power before connecting and disconnecting portable or stationary electrical devices and equipment in hazardous locations. This explosion proof 3-way tumbler switch is ideal for operators seeking a high quality explosion proof switch rated for use in hazardous areas designated Class 1 Division 1 and Class 2 Division 1. This explosion proof switch is rated at 20 amps-120-277 Vac and 1 HP at 120 Vac and 2 HP at 240 Vac. The entire unit is constructed of malleable iron and contains an internal sealing chamber constructed of copper free aluminum. 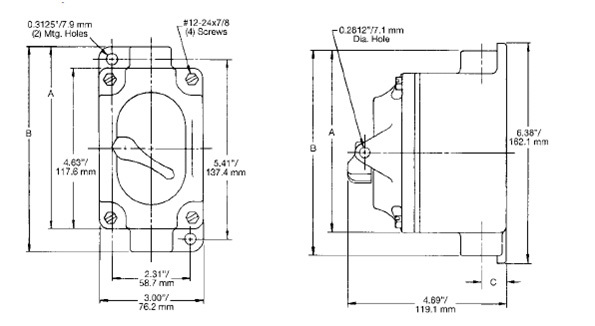 This unit is easily wall mounted via integral mounting tabs at two corners of the housing and provides two 1/2" hub openings located on the top and the bottom of the housing for running electrical conductors in a feed through configuration. A bushing seal at each conductor opening prevents damage to wiring insulation and a triple coat housing finish provides rugged protection against corrosion. This unit is rated to handle electrical loads of 120-277 VAC up to 20 amps and is suitable for use in environments where combustible dusts and particulates may be present. 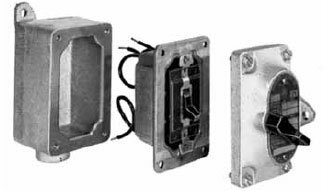 The EPS-25A-3W explosion proof switch cover and housing box is constructed of malleable iron with all arcing devices contained within an explosion proof labyrinth switch for the highest protection possible. The entire unit is triple coated with zinc electroplate, chromate, and a final epoxy powder coat for maximum durability and corrosion resistance. Each 1/2` hub opening is fitted with an integral bushing to prevent fraying or damage to insulation. Two external mounting lugs provide simple and secure mounting of the unit to walls and flat surafces. The unit box, switch, and face plate are all included with the product. 1/2" NPT tapped conduit openings are provided on the top and bottom of the unit in feed through versions while dead end versions have a single conduit hub, providing easy and secure connection to main power line supplies.